Today I wanted to bring to your attention a campaign that really stood out to me as something positive for the plus size community, with a great message and I want to publicly show my support and do what I can to promote it. It is of course, #Stylehasnosize. 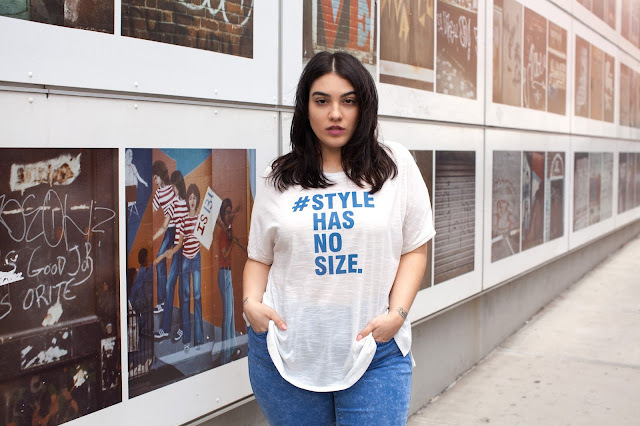 Style Has No Size is the slogan for this summer, celebrating body confidence and making a bold statement that style is not about the size you wear, it's about how you style your size. This is something I literally could not agree more with. I'd like to think that my whole blog is based on a similar premise, to show that being plus size doesn't in anyway hinder your ability to be a stylish and all round awesome person. There are various bloggers and models supporting the campaign including two of my absolute role models, Nadia Abholuson and Gabi Gregg from Gabifresh who I really admire for their accomplishments so far in their careers and contributions to the plus size industry. So what can you do to support this campaign? 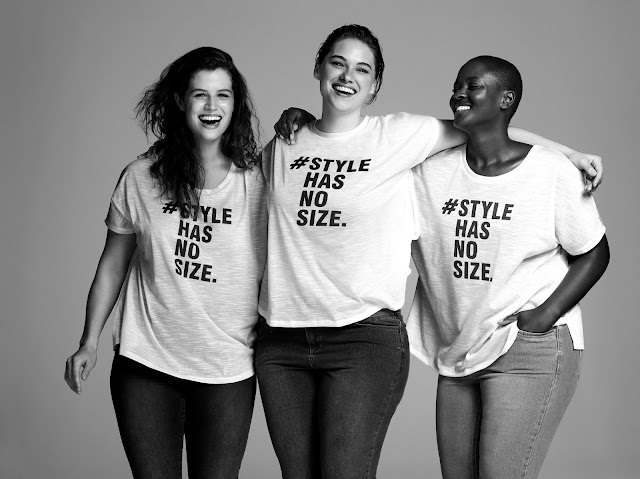 Evans are selling the #stylehasnosize tshirts and bag on their website and to raise awareness you can tweet or instagram pictures of you wearing them with the hashtag to spread the message. All profits from both items go to the Rainbow Trust Children's Charity which support families with a serious ill child which is an amazing cause. Here I am in my tshirt. The day I stumbled upon the plus size blogging community is a day that my life really changed dramatically. I remember just feeling so overwhelmed and almost validated in a way, that these women that look just like me are wearing all these fashionable, beautiful clothes and they are KILLING it, so maybe I could too! It opened my eyes to whole new perspective and I feel like they have remained open since. Nowadays I look at myself completely differently and don't focus on how much better I would look thinner, hating the way I am and wanting to change. I am more of a "this is what I've got", what awesome stuff can I wear to build upon that and not to in any way hide or change it. When it comes to clothes, as a plus size person I feel like I have choices available to me now that I just didn't 5 years ago. Notable collections for me, coincidentally most of my favourites are by Evans who I would deem as a true pioneer in plus size fashion with collections like Beth Ditto for Evans, Cut for Evans which is my favourite lookbook I've ever posted and The Design Collective which I did a whole post on here and will be doing outfit posts around shortly. I've also seen the images for the upcoming Cut For Evans collection and let's just say that I am excited and literally counting down the launch day and plan to do a lookbook or outfit posts around that too. I hope you all liked this post, the campaign really is something that I think is important and that some people might need to see in order change their mindset like I did. I'd love to hear about your journeys to body acceptance and what triggered that or alternatively you might always have been body confident in which case I'd still love to hear about that too and tips you might have for other ladies.